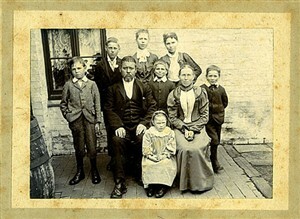 This is a photo of my grandmother and her family taken when she was 5 years old. Her name was Sarah Reading, she was the youngest and was born partially sighted. Because of her disability, it meant that she had very little education and was given just the menial tasks at school. Her father (my great-grandfather) was totally blind and stood on the street corner selling boxes of matches and was known as a 'Hawker'. The family lived in Egremont Street and as you can imagine were very poor. Soon it became too much for my great gran to cope and the two naughtiest boys, Charles and Henry, were sent to Dr Barnardo's in London and from there they went on a ship to Canada. Unfortunately gran lost touch with them and must have missed them terribly because they were the youngest. Gran was a very sick child and was in and out of hospital all of her life, altogether she had 8 operations. She became a single mum at 22 and the father was a soldier. They married 2 years later and my mother was her only child. In 1904 her husband, who had left the army and worked as a drayman, was on his dray in Lewes Road when he fell, landing between his horses who were pulling the cart, and was killed. Because there was no money coming in the house, mum, who was 13 years old, left school and went in service in a posh house in Sudeley Terrace. 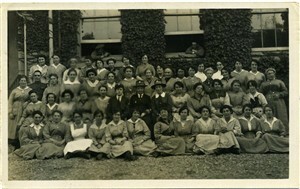 Then, when the war started in 1914, she worked as a nursing auxiliary at the Royal Pavilion where the wounded Indian soldiers were taken. 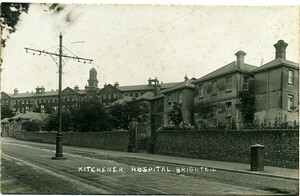 Later she transferred to the Brighton General Hospital where the British wounded were sent from France. Here she met my father, whose home was in Derby, and they married 12 years later. This page was added on 20/06/2006.